Bring MM to your homeless clients. Miracle Messages has reunited 201 people experiencing homelessness with their loved ones, with an average time disconnected of 20 years. Click “sign up” to take the first steps to offer Miracle Messages to your clients today. Below is a stepwise guide to offering Miracle Messages. Our hub for volunteers and partners to connect and share ideas (here). We will send you the invite link once you sign up. Get the word out. We have materials you can post and distribute, including flyers for clients and for staff, our paper intake form, and our business cards for our 1-800-MISS-YOU hotline (PDF file). You can also request one of our charging stations (pictures here). Join us for one of our weekly conference calls, and get your staff trained to offer MM. Mondays at 5:30pm PT for recording MMs and Wednesdays at 6pm PT for delivering MMs. Click here to see the full schedule. For a comprehensive guide to offering Miracle Messages at your facility, including tools, processes, and information we collect, check out our partner training guide below. What is the impact of partnering with MM? 1. Timothy had not seen his family in 5 years – he lost their contact information. During that time, he had been living on the streets of San Francisco. 2. A caseworker learned about Miracle Messages. She referred Timothy to us using our online form. 3. Once we received Timothy’s MM, our digital detectives got to work, trying to locate his family. 4. Within a week, we received a letter from his family: they’d been looking for Timothy for years! 5. Just three weeks after the initial caseworker referral, Timothy boarded a bus to reunite with his family in IL. They’ve been living together since. Miracle Messages is a nationwide message delivery service that clears the way for diversion, problem-solving, and rapid rehousing by helping staff at partner sites (caseworkers, social workers, outreach workers, etc) address the massive digital literacy barriers, bureaucratic barriers, and emotional barriers that their homeless clients often face. This includes: helping clients find phone numbers, reaching out to loved ones via Facebook, navigating around HIPAA restrictions, and addressing the shame / fear that prevents them from reaching out. How does Miracle Messages work? Miracle Messages offers clients the opportunity to record and deliver a message to a loved one, even if the client doesn’t know how to reach them. When a message is received, Miracle Messages’ digital detectives attempt to locate the loved one online and deliver the client’s message. Once a message is successfully delivered, Miracle Messages continue to act as a communication bridge between the homeless client (and their caseworker) and the loved ones. Miracle Messages can be recorded from clients through our online referral form, our paper-based form, our 1-800-MISS-YOU hotline, and our mobile app. How is Miracle Messages effective for clients? Miracle Messages lowers the barriers to reaching out, and we meet clients where they are at. It’s that simple. As a result, we have reconnected 201 people experiencing homelessness with loved ones, by simply offering the chance to deliver a message. MM offers clients a low-stakes, low-barrier opportunity to say “hello,” “I miss you,” “I love you,” or “I’m sorry” — just send us a message that a client would like delivered, and we’ll do our best to deliver it! By offering this first step toward reconnecting, we are creating an avenue for hope, without creating undue pressure or stress for clients or their loved ones. How is Miracle Messages effective for partner sites? Miracle Messages is a lifeline for clients and a resource for staff. 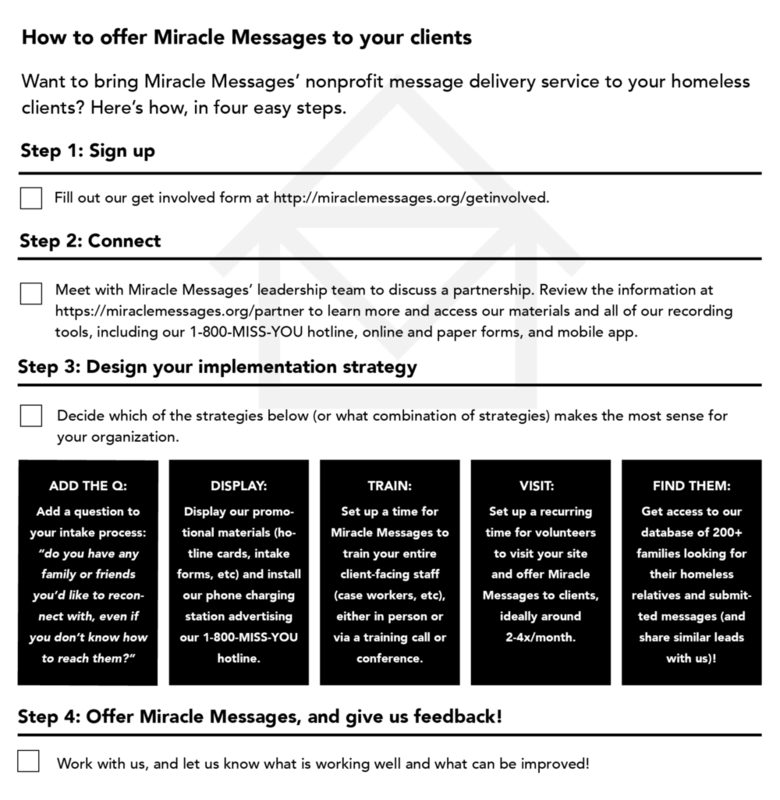 We designed our service as a resource for caseworkers, shelters, outreach workers, law enforcement, and other personnel who are engaging with homeless clients. Delivering messages—and acting as a messenger between two parties—can be extremely time consuming. Finding loved ones can require extensive research, multiple phone calls, and repeated callbacks. We know that most professionals on the front lines of homelessness don’t have the time, bandwidth, or leeway to take that on. That’s why we do this work for you, so that you can focus on your clients’ other needs while we locate loved ones and deliver messages. Ready to offer Miracle Messages? Here’s how. All prospective partners begin by filling out our partner sign up form (also known as our “Get Involved” form) to begin receiving important updates, trainings, and resources from MM. I just wanted you to know how much the clients and my staff appreciated your interaction on our site yesterday. As you can probably imagine…self esteem is a key barrier to homeless individuals and is something we are constantly working on with clients. The clients that participated were absolutely jazzed when they completed their miracle messages with you and are still talking about it this morning. Sometimes people don’t realize how such little things can create such a huge difference and make these folks feel like they belong again. Storytelling is the root of understanding people at a deeper level. At St. Anthony’s, every day we bear witness to stories of incredible triumph and struggle from our homeless brothers and sisters in SF. Miracle Messages is highly skilled at capturing these stories and sharing them with a wider audience to effect change for this vulnerable population. We are blessed to work with Miracle Messages as a partner to give people a window into the heart of the Tenderloin.